The undeniable L is back tonight with a look at a recent Sideshow Star Wars release - tell us all about it, L! 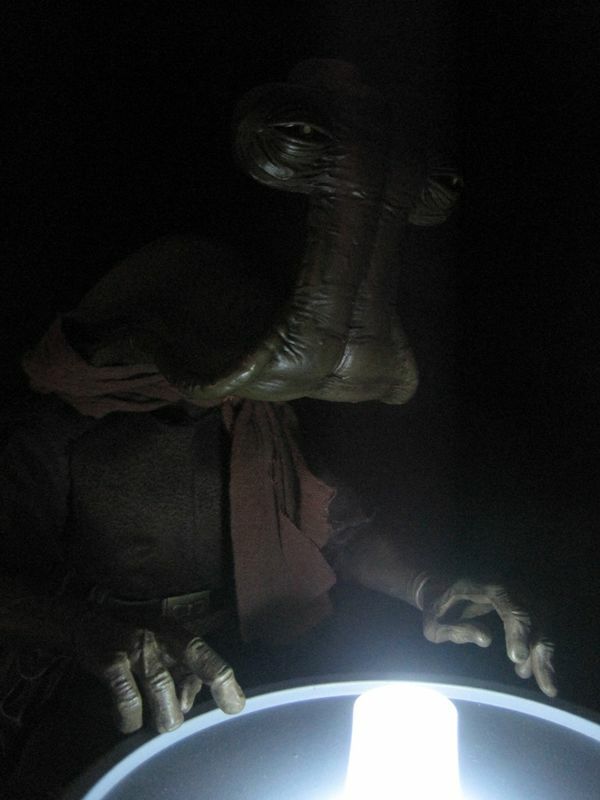 Hey, kids, it’s Momaw Nadon! 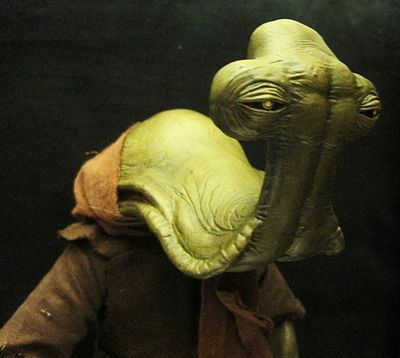 Once he was just “Hammerhead” but then somebody somewhere (almost certainly at Decipher) decided that every random extra in the original Star Wars trilogy needed not only a proper name but an extensive background. 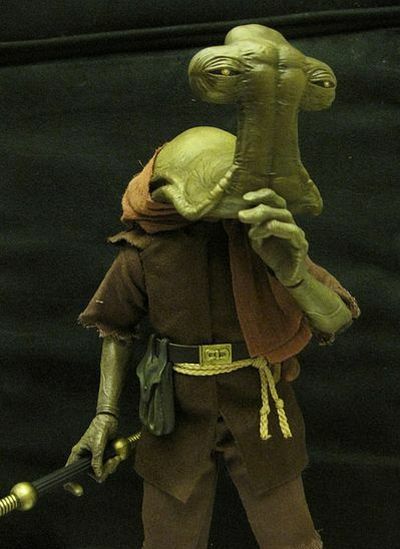 Hey, presto: meet the Ithorian monk (or whatever he is) Momaw Nadon. This figure is something new from Sideshow. While we have seen aliens from them before, there haven’t been many, and all have looked more human than the uniquely bulbous and bizarre Hammerhead. Hammerhead is also a somewhat iconic figure from the vintage line, a crazy-looking alien that kids loved despite having nothing to do with the main story. And, hey, he’s a movie star! 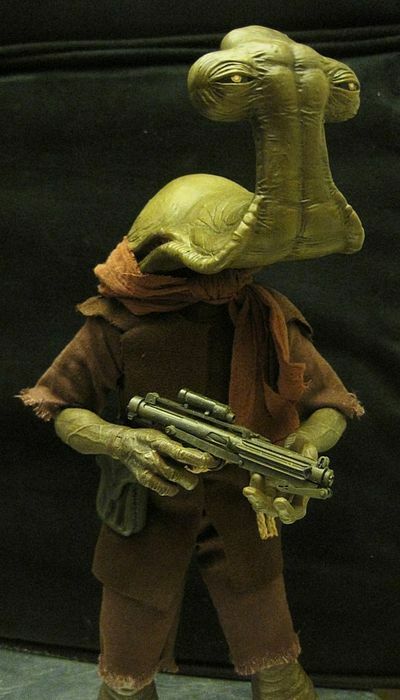 Hammerhead is one of the few action figures ever – maybe the only one – to have been featured in a movie. Early in Spielberg’s E.T., Elliot identifies Hammerhead to his new alien friend while playing with his Star Wars toys. 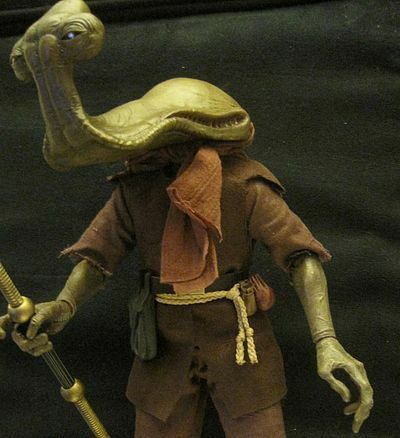 This figure is consequently noteworthy both as a great throwback to a classic part of the vintage line, and also as the first foray of the Sideshow line into the more unusual corners of the Star Wars universe. It’s a fantastic example of an “I can’t believe they made THAT” figure. The packaging is stellar as always, but it’s hard to keep praising the packaging for the same features. I wouldn’t mind if Sideshow shook things up a bit here. Still – good photos of both the product and the reference material, a good write-up of the character, collector-friendly. It’s a good box. 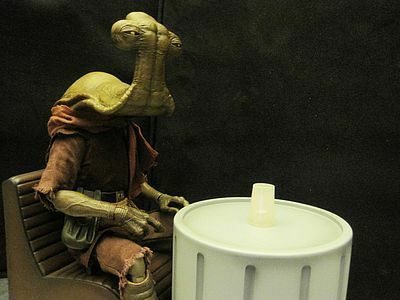 As a fun acknowledgement of the vintage line, they even include his vintage sobriquet alongside the new, more sensitive “Momaw Nadon.” One side note which I’ll also mention in the Accessories category: the box erroneously lists a Cantina drinking glass as included with the figure, but early reports indicate that no such accessory is there. Mine certainly didn’t have one. Sideshow faced a number of challenges here. First, the movie only really shows Hammerhead from the chest up, so not only do we not have an official movie version of the rest of his design, we don’t even have official proportions for the guy. Of course, Hasbro has already produced a smaller version of the character, so it’s not as though Sideshow had to invent him from scratch – but they had to make something that feels right, something that seems like he belongs in the movie. A large figure like this can have a lot more detail than a small one, and needs to look believable. Second, they had to produce something that could STAND. The head is clearly huge – but how huge can it actually, practically, be? They did a great job. The design of the character has really been done justice – he looks knotty and veiny, like he’s walking swamp vegetation. The head has character, bearing the same blank (perhaps mournful) expression as in the film, with little details like the teeth in his mouth (along the side of his head) and the drooping eyelids. The hands are wonderfully detailed and wrinkled, there are veins running up his arms,his legs look vaguely like elephant legs, with folds and bumps and elephant-like toes. Because the head is done in a rotocast style, it’s hollow (and a bit squishy) which makes the figure lighter and easier to balance. It also has another crucial benefit: the head can be posed without drooping over time under its own weight. I might be being too hard on Sideshow here, comparing the final product to the mock-up presented at Toy Fair months ago, but in the end while the paint impresses, it just doesn’t have the same depth, the same richness of tone, that it might. It’s still pretty great, though. It does a good job of bringing out the details in the sculpt, and makes vivid and eye-catching what is essentially a very monochrome figure. Judged without reference to what might have been, it’s very possibly a four-star paint job. They also managed to highlight the folds on his legs without making him look striped, which can be very tricky given the design. But there still isn’t as much shading as there might be, and the eyes, which look pretty great from a distance, are a bit sloppy and cartoonish when seen close up. The outfit hangs well and fits snugly without restricting his movement, but two things bother me. First, the color seems the tiniest bit too red to me. 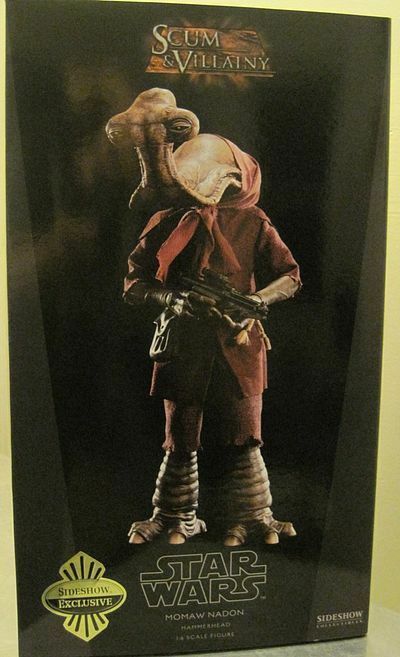 I’m sure Sideshow did their homework and I don’t doubt that the original costume could be this color – but in the dim lighting of the Cantina, through the smoky haze, it certainly didn’t appear this colorful. I’d have rather seen more muted tones, darker browns. Second, and more importantly, the hood is too tight around the back of his head, looking more like a bandana or a scarf than a hood. He looks like a babushka, like a little old granny going out for groceries on a Sunday morning. It’s foolish. Luckily, it’s possible to pull down, but that means you can’t have his hood up -- I think the material needs to be thicker, and there need to be some folds in it, and it needs to sit on his head a little more loosely. Again, it’s entirely possible that the fit here is “film accurate” – but what is seen only fleetingly, in smoke and shadow, is not the same thing as what is seen in the bright lighting of a toy shelf. It may have worked in the former, it works less well in the latter. In other respects, though, the outfit is pretty great. His belt looks like a real rope belt, there are pouches hanging off it in various places (which can be moved around). The outfit is raggedy, shabby, with loose threads hanging from the edges. It effectively suggests that this is an outcast, someone powerless and disenfranchised. There really isn’t any better articulation here than we’ve seen in prior figures, but maybe because the outfit is less restrictive than most, it ends up SEEMING like he’s more poseable. The double-jointed elbows are wonderful, the ball joint on the neck allows for all sorts of expressive positioning of that outrageous head. The legs are designed well enough to keep him standing, with ball joints at the ankles and hips and double pin joints at the knee, so he can be posed dynamically, he can sit at the bar, he can stand pensively in the corner, all without toppling over. I’m not a collector who cares all that much for accessories unless they are traditionally associated with the character (Captain America’s shield, Frodo Baggins and the One Ring, Darth Vader’s lightsaber). If it doesn’t fit onto the figure somewhere, it’s just clutter that I have to store somehow. Still, when figures are this expensive, it’s nice to see some gesture towards giving you a total package. This time we have two extra hands, and a gun which is essentially the standard issue stormtrooper blaster done with some rusty brown detailing. It’s neat and all, but a bit uninspiring. Given that the original intent was clearly to include a Cantina drinking glass (which the box fallaciously indicates is present), it’s particularly disappointing that he comes with so little. 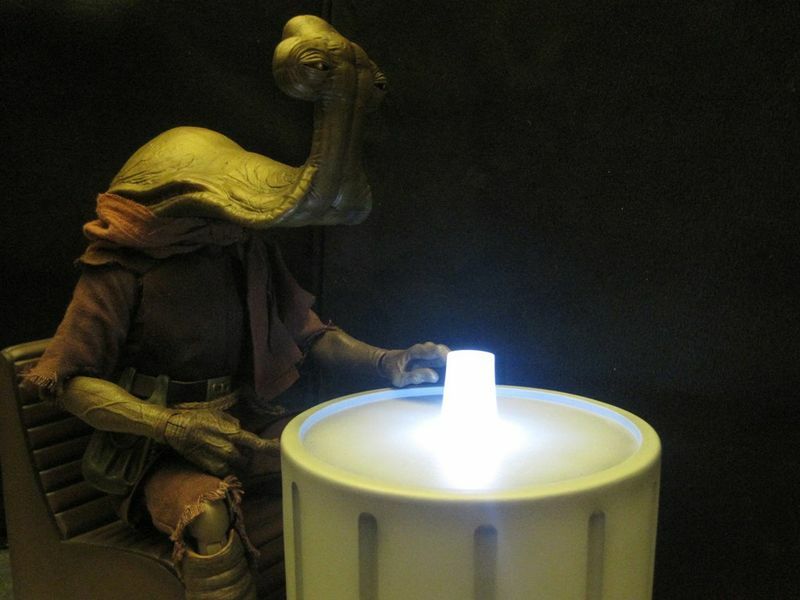 Since Sideshow has made not one but two Cantina environments so far (the table and chairs for Greedo and a slightly different table for “Nadon’s Nook”), a unique and interestingly funky sci-fi goblet of some kind would have been kinda cool. Buyers of the exclusive edition do get a decent accessory, albeit a non-film one: his staff, seen also in the most recent Hasbro 3 �” version of the figure. It’s well done, simple and basic but not bland, and it can be used to give him a more “fantasy” appearance. 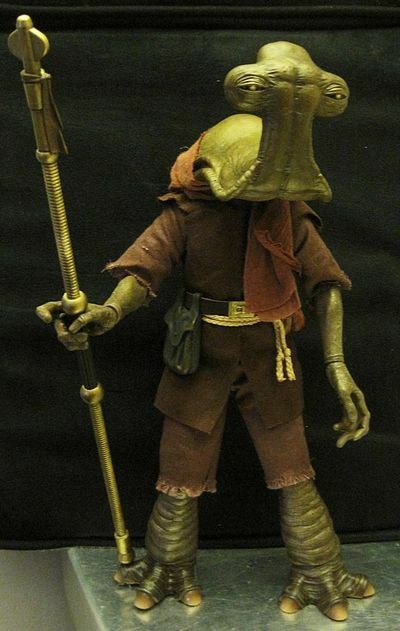 Still, for a character known primarily for hanging out in a bar in the middle of the afternoon, it’s a shame we didn’t get some fun Cantina-specific accessory. A space ashtray. A galactic cocktail napkin. An interstellar coaster. large or elaborate as the Gamorrean Guard that costs the same, but given the fact that he’s not only got new hands and a large head, he’s also got uniquely sculpted legs and feet – eh, it doesn’t strike me as grand larceny. I’d be happier if Sideshow released a figure like this for $80-90, sure, but at the current price I’m not feeling robbed. This is where the figure shines. The sculpt is great, as well, of course, but both the paint and the outfit are both a smidgeon shy of truly outstanding. But what really matters is that this is a really fun toy. Because his design and costume are fairly simple, he’s sturdy enough that even younger, slightly more reckless fans could play with him without him breaking. But more importantly, he’s a freaking weird looking alien. That’s awesome. He’s eye-catching, he’s poseable, he’s evocative of exotic locales and intrigue, he’s just what he should be. Yes, I’ve quibbled over some minor points here, but really this is a fantastic figure. He’s unique, he’s iconic, he’s both a great reminder of where Star Wars toys began and an exciting new direction for the current line. It’s always fun to see something truly original in a line that’s gone on for so long, and we’ve never seen a 1:6 Hammerhead before. And, hey, this one’s really well done. This product was purchased for the review by the reviewer. Photos and text by Lawrence Horsburgh.